Erasmus+_"Refugees and Frontiers:Keep Europe United"
02/10/2017 : Athens Transnational and International Meetings. Project's Dissemination Perfomance. Karolos Koun Theater. The Invitation and the Program. 1. "Everything is road": Modern Dancing perfomance on Refugees and Immigrants theme in Greece in 20th century. Project's Dissemination Performance. Karolos' Koun Theater. 2. "Monologues across the Aegean Sea" : Dramatization of minors' refugees narrations arrived at Greece in 2015. 3. "The uninvolved school desk" : A Documentary awarded a distinction on behalf of Greek Ministry of Education focusing on Refugee Issue,Diversity,Multiculturalism and Acceptance in Greek Educational System. Project's Dissemination Perfomance. Karolos' Koun Theater. 4.Music Concert. "Survivor" Project's song. 5.Greek Team dances : Greek Traditional Dances.The Closing.02/10/2017 : Athens Transnational and International Meetings. Akropolis place : Keep Europe United. Lipdub!!! 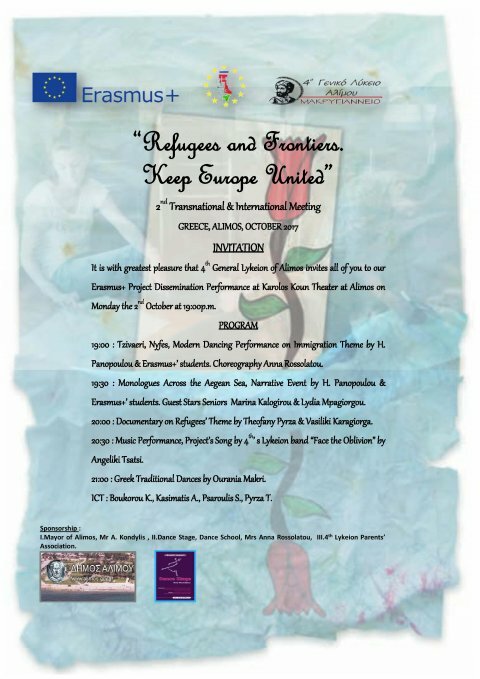 Erasmus' song on Refugees composed by the Greek students' Erasmus team and displayed on the 1st official project's announcement -dissemination event at local society on November 2016. Digital Narration by Greek team's teachers F. Pyrza, V. Karagiorga, A. Kasimatis on Refugees (before project's approvement) by which the 4th GEL of Alimos was awarded a prize from the Greek Ministry of Education, May 2016. This publication reflects the views only of the author, and the European Commission cannot be held responsible for any use which may be made of the information contained there.